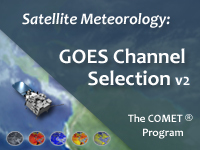 This module is an update to the previous Satellite Meteorology: GOES Channel Selection module. It reviews the five GOES imager channels and their use, incorporating conceptual visualizations and numerous imagery examples. The module also includes updated information on improvements for the GOES-13, -14 and -15 satellites. Highlights include a higher resolution 13.3 micrometer CO2 channel (GOES-14 & -15), modified spectral response of the visible channel, improved radiometric performance and pixel geolocation, and shortened data outages during the fall and spring satellite eclipse periods. There are frankly better and more up to date resources for learning about GOES satellite uses. This lesson will need to be updated. The way the module is presented is also very non-engaging and very dry. Would prefer more hands on analysis with each subject rather than just a ton of things to memorize and then vomit back in a quiz at the end. I'll admit, I had to take the quiz more than once. Well put together online course. This is very good for my satellite climatology class. October 2016: HTML and media assets in this lesson have been updated for current browsers and mobile devices.